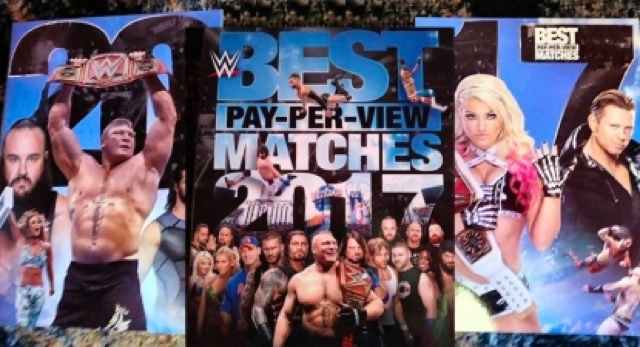 Once more, WWE release their annual compendium of Pay-per-View matches 'The Best PPV Matches of 2017'. As usual with these type of DVD sets, one should expect samples and highlights of the year's best feuds and championship matches - greatly expanded once again as the two brands establish their own respective titles. Disc One, at first glance of the contents list, appropriately appears to be very SmackDown-heavy, considering the critical positivity surrounding the brand going into 2017. First up was the WWE championship bout that saw perennial poster-boy John Cena claim the title from AJ Styles, a refrain of 2016's arguable feud-of-the-year, to tie with the legendary 'Nature Boy' Ric Flair at 16 WWE-recognised world title reigns. This wasn't the year for the Rumble match itself to get on the 'best-of' list, but second-time winner Randy Orton had his subsequent Elimination Chamber PPV match with Luke Harper included, foreshadowing a feud with the winner of the event's eponymous match. The Elimination Chamber match itself was one of the most coherent of recent times, and provided overdue WWE championship recognition for Bray Wyatt as he surprisingly defeated Cena, Styles, Dean Ambrose, The Miz and Baron Corbin. Whilst that would have set up the traditional WrestleMania main event, the three examples from this year's 'Superbowl of Wrestling' didn't include Orton's almost inevitable victory. Instead, we get Styles versus 47-year-old boss-man Shane McMahon (which, to be fair, built a slow start into a serviceably entertaining bout). The Cena & Nikki Bella mixed-tag against The Miz & Maryse was turgidly paced, and whilst the ensuing marriage proposal was highlight-worthy, the match itself is hideously misplaced on any 'best-of' list. In contrast, the feud between the phoenix-like Universal champion Goldberg and Brock Lesnar has been denoted by explosively brief, almost terse, matches. Lesnar's WM33 victory here was almost an epic by their standards, and began to approach double-figures in terms of minutes' length... almost as long as Goldberg's entrance down the interminable ramp. The crowd had fun counting the suplexes and spears though. The second DVD features more RAW, with two post-Superstar-Shakeup matches from Payback opening the disc. Alexa Bliss becomes the first woman to have held both brands' titles when she takes the RAW women's championship from Bayley, whilst the second features the objectively brilliant feud between Roman Reigns and Braun Strowman beginning to peak. A brief sojourn back to SmackDown sees the start of Jinder Mahal's initially unlikely but ultimately productive WWE championship run, taking the belt from Orton at Backlash. The first of three excellently free-flowing 'Fatal' matches on the set, this one a 5-Way match to determine the number-1 contender for WWE Universal championship, sees Samoa Joe overcome Reigns, Wyatt, Seth Rollins and Finn Balor. The Universal title bout at the rock-n-roll-retro Great Balls of Fire is one of that archetypal 'big fight feel', full of impassioned brawling, but ultimately unsuccessful for Joe. Sandwiched in between was the first ever Women's Money-in-the-Bank ladder match, but the good-to-excellent bout was marred by the thoroughly objectionable finish. Carmella comes away with the case in circumstances shrouded in understandable feminist controversy. The final fight of the DVD is the tag-team championship match between The Usos and The New Day. New Day gain the SmackDown gold after previously holding their RAW equivalents for so long; Xavier Woods looking particularly dogged, enough to get his first belt-winning pin. medical attention to retain against a resurgent Reigns. Bliss underlines her 'Five Feet of Fury' moniker, defeating Bayley, Emma, Nia Jax and Sasha Banks in the final fine 'Fatal' fight to retain her title at No Mercy, which also provided a clash of titans in the form of Cena versus Reigns. No matter which side the perennial detractors fall, this is an exemplar match of WWE's heavyweight Sports-Entertainment style, both technically and narratively. A casual observer, using this DVD set to stay moderately up-to-date on WWE goings-on, may be forgiven for thinking that Shane McMahon is a top-tier major draw, judging by a second inclusion. The match with Kevin Owens at Hell-in-a-Cell is a worthy addition though, if inevitably a little formulaic. Sami Zayn makes a timely intervention to cement the restoration of his and Owens' friendship, and save his Canadian compatriot from Shane-o-Mac's 20-foot cage-top plunge. The set concludes with the strongest technical match-up: Styles versus Balor, a veritable exposition of intricacy and almost Indy-level pace, but one, no-matter how you look at it, that missed the gun narratively. As a last-minute replacement match it is mind-blowing, but a year-or-so before it would have been the battle of the Bullet Club (even if they couldn't call it that), or with some build-up it might well have been 2017's pure gold.